Japan: Everyone is invited to Japan Foundation’s free films but reservations required 416-966-1600 X 229. Nara was the capital of Japan in the 8th century. At that time a robust cultural style flourished called Tenpyo. The screening series explores the precious legacy of the Tenpyo culture preserved and passed down in Nara for over 1,200 years. Friday, April 7, 2017, 6:30 p.m. Tenpyo Art Screening Series I: GIGAKU, Reviving a Mysterious Ancient Masque. 58 min. 2002. Giant masks from ancient times are stored at the Todai-ji Temple and Horyu-ji Temple. These are the reminiscence of Gigaku, a performing arts tradition which became extinct more than seven hundred years ago. 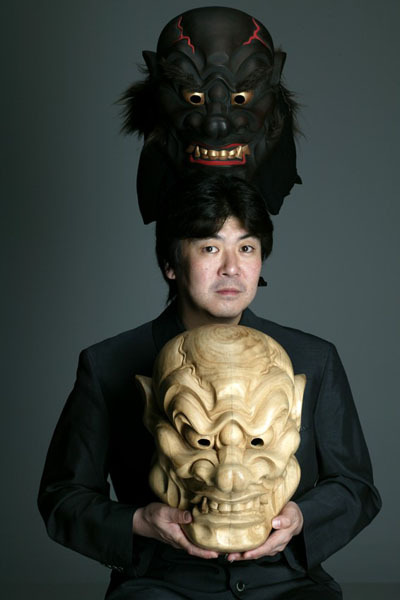 The late Mannojo Nomura V (1959-2004), a Kyogen master, revived Gigaku in 2001 in the belief that the tradition of masked pantomime theatre travelled along the Silk Road, absorbing local arts on the way to Japan. This is a documentary of the collaborative performance of multiple nationalities, such as Chinese, Korean, Indonesian, Indian, Congolese, and Japanese, which resulted in an outstanding celebration of humanity. Thursday, April 20, 2017. Tenpyo Art Screening Series II: Festivals of Fire in Nara. Introduction to the seasonal festivals of fire in Nara. Dancing Flames in the Winter Night: The Ancient Capital Nara. 25 min. and additional video presentations. Friday, April 28, 2017, 6:30 p.m. Tenpyo Art Screening Series III: GAGAKU, Music for Eternity, 2009. Introduction (28 min. ), and a few full performance. Friday, May 19, 2017, 6:30 p.m. Tenpyo Art Screening Series IV: Dattan. Video presentation of the original festival ceremony and a dance performance inspired by the fire ceremony of Dattan. Friday, June 2, 2017, 6:30 p.m. Tenpyo Art Screening Series V: The Book of the Dead. An animation film by Kihachiro Kawamoto Based on a novel by Shinobu Origuchi. 70 min. 2005. If you are interested, please save May and June dates as these will be the only mention of these films here. Ruth. Ireland. A Night of Irish Music and Poetry. Spur’s 5th Literary Festival funded by Culture Ireland. Friday April 7. 8pm.. The Heliconian Club, 35 Hazelton Avenue. https://spurfestival.ca/spur-presents-a-night-of-irish-music-and-poetry/ . 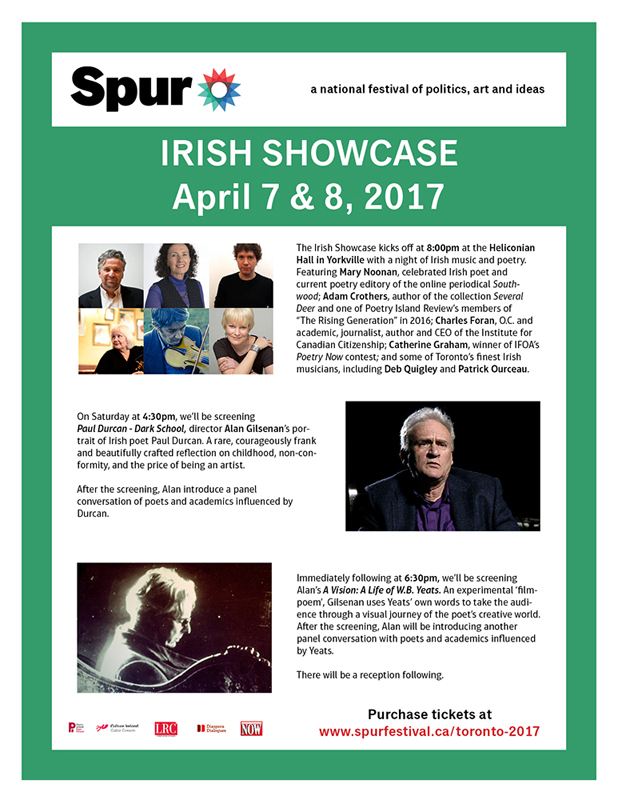 Part of Spur Festival which is also showing Irish films on April 8 at Innis Town Hall. https://spurfestival.ca/app/uploads/SpurProgram_Toronto_hires_electronic.pdf . Toronto Festival Pass: $100 plus HST. Individual tickets between $5 and $20 with multiple event and student discounts available.